During the mid-Victorian period, it was customary for families to pay a rental fee for their church pew. Naturally, those wealthy enough usually paid for the best (usually meaning the most prominent and easily visible) seating. However, this left poor families at an enormous disadvantage as the increasingly large box pews were taken by the wealthy parishioners. In 1848 Samuel Daukes (sometimes spelled Dawkes) designed a Gothic Revival church dedicated to St Saviour, away from the town centre and the parish church of St Mary. St Saviour's was intended to provide for those poor families who could not afford to rent a pew at St Mary's. Daukes was assisted in his design by John Hardman and AW Pugin, the man responsible for the Gothic interiors of the Palace of Westminster in London. 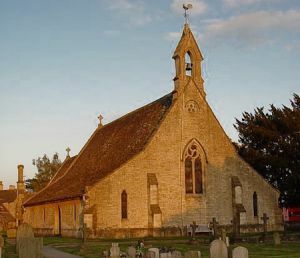 The church consists of an aisle, nave, chancel, south porch, and bell turret at the west gable. St Saviour's still has its original Victorian gas lighting. Though no longer in use, the original gas fittings, pipes, and wall brackets with glass shades are still to be seen. One extraordinary addition to the gas lighting setup revolves around the beautifully carved wooden rood screen. At the top of the timber screen is a row of gas jets creating a burner bar - I can't imagine modern health and safety officials approving such a plan today! St Saviour's is an excellent example of Gothic Revival style and a graphic reminder of Victorian High Church attitudes. The church is no longer used for regular worship and is in the care of the Churches Conservation Trust.